A real letter in our mailbox! Ok, so I have not written you in many moons, at least not a letter written by hand. A lot has gone on the past few months. So I came into Fort Dodge with 2 other companions. As it stands right now I only have one, Elder Noel. I am also District leader for the second transfer in a row. It's tough but I think that I am getting used to it. Last transfer district meeting was only 1 1/2 hours long, but now President wants it to be 2 1/2 hours long. So I have to teach a little bit longer. The hardest part I think is being that example to everyone, and most of everyone in the district has been here longer than I have, so I have to keep myself in check. President says "As goes the district, as goes the mission". So I'm trying to do everything asked of me. So last week was a weird week like I was telling you. Nothing to get nervous about, just a little opposition, ALL WEEK LONG!! Wow, it was a hard one. I have had days that felt that bad before, but for a whole week, it was literally draining me of energy. Never had something like that before. But I'm back to my old self, my neck still hurts, ( I think sleeping on the floor threw something out of wack), so I might have to call the missionary mom (Sister Jergensen) about it. Enough about me, now about the area. Ft Dodge is such a farming town, and all the other outside towns. Dad you would love it. Don't worry, I got some pictures the other day. You know, some John Deere stuff. Oh and I also got you a puzzle at the World's largest Truck Stop! It's of a cow, your favorite. I really don't have any awesome, cool amazing stories if you guys were looking for that (at least not at this point). A lot of what we have to do is defend what we believe, and not bash with people. Because of where I am at, in the Bible Belt of America, and how close I am to Nauvoo and other old church sites, there is a lot of contention with the people and the church. The other day Elder Noel and I tracted into a lady who knew a lot about our church. She went on to say that the Book of Mormon was false, because it was an "additions to the Bible" as it says at the end of Revelations. So we said if we look at Deuteronomy 4:2 and 12:32 it states that exact thing stated in Revelations,"Do not add or take away from God's word", but Deuteronomy was written thousands of years before Revelations. And that is because the Bible is compiled of 66 separate books that were later put together to make the bible as we know it today. So the statement "do not add or take away from these things" is only talking about Revelations and not the bible as a whole. Concern resolved, right? Nope, she then went off about grace and how we (as in God's children) are in a grace phase and we don't need to show works. All we have to do to be saved is accept Jesus into our hearts and that's it. You wouldn't believe how many people actually believe this. We went back and forth about this topic for a few minutes while we were sharing bits and pieces from James 2: 17 -26 about faith and how it is tied to action. She then suddenly looked at me and said, "So what is all of this about?" I said "There is a prophet right now, leading and guiding all of God's Children" She looked me square in the face and said boldly "You're Wrong!" This was one of the times where I felt so sorry for this lady. Here is an opportunity knocking at your door inviting you to come closer to Jesus Christ and Heavenly Father by making a covenant with Him, and ultimately receiving exaltation, but you closed your mind and hardened your heart. I just felt so sorry for her. Oh, I forgot to tell you there is a member in the ward here, his name is Brother Jensen and he served in Phoenix, well actually it was more of south Phoenix, but he served briefly in our stake. He was transferred to the Biltmore ward for a week and went to our stake center. He also know Bishop Riding when he was a councelor to the Mission President. It's a small world in the church. Our apartment rocks! It is way bigger than the one in Clinton. We have a ping pong table, a bunch of work out gear and a washer and dryer in the apartment. The complex really isn't that big. There is probably 30 or so apartments in the whole thing. The only bad part about it is that we are located on the edge of town on top of a hill. So when ever we take the bikes out, it is fun leaving, but coming home is always a pain. Being a district leader is fun to say the least. It wears me out though. Right now in this new district, there is Elder Noel and I in Fort Dodge, Sister McGuire, Sister Dalton, Sister Guthery in Hampton, and Elder Franz and Elder Wilson in Mason City. I cannot believe Elder Wilson is in the district! He followed me all the way over from Clinton. I get to go on exchanges with him as well so I'll get to hear about what's new in Clinton. This letter is a little bit different than the ones I usually send. I hope it gives a little more insight on the mission life. I agree mom, we never really talk because we write about different things on different days of the week. It's like we both say stuff and not much response, I'll try to do better. I want to thank you for the information about Jonathan H. Hale and Elijah Thomas. When we went to Winter quarters, we were able to go on a tour of the visitors center. After we went through the temple, as we started the tour, the sister missionary started going off about how much the saints struggled and the pain and suffering that they had to bear. She then compared that struggle to the struggle of missionaries today then compared it to our own missionary struggle. Then the sister missionary took us over to the "look out" where it overlooked the temple and the graves. She then asked us why we were on a mission I got a little choked up, just a little bit, then told a small portion of my conversion and how I had got there. We then went on through the whole tour and still having our missionary struggle compared to the saints' struggles. And then you sent the stories of our families and what sacrifices they had gone through to build God's kingdom once again. It was truly amazing to realize that I am serving in the same area where my family served, still building God's kingdom. I put those stories right next to my patriarchal blessing in my mission folder. Well, I love you guys and thanks for the Halloween package. Did you have a good birthday? Did you celebrate? Yes, I had a great one. Elder Noel made the cake and then Elder Johnson and Noel both sang. It was a treat. What was your first impression of Fort Dodge? Wow, more corn! At least everyone has a John Deere. It looks like there is a river through town. What river is it? It's the Des Moines River. I've only seen it a couple of times from the bridge, not up close or anything. Is it weird going to church when you don't know anyone? Is the ward friendly? Yeah, there is not a lot of consistency with a majority of the members so I am still seeing new people week to week. But the ward is so helpful when it comes to missionary work, they are great. Will you have a car in Ft. Dodge? Oh yeah, our area is so big. It's the 2nd biggest in the mission. Every other week, I have to drive to Mason City which is 100 miles one way. I'll have to get you a map of our area. Who are your companions and where are they from? 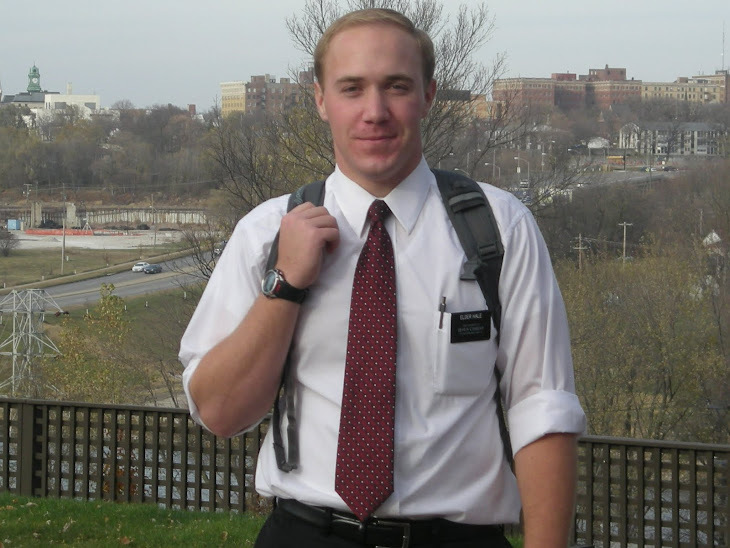 Elder Johnson - He lives in Cache Valle Utah, just minutes away from the Idaho border. He grew up on a farm and wants to be a farmer. So I refer to him as my Farmer Almanac. Elder Noel - He always refers to his home as the Salt Lake Valley. I'm not really sure where he lives exactly. I don't think that he does either, his mom has moved twice while on his mission. Tell me what is good and what is bad about having 2 companions instead of one. Good - Well, with 2 companions, there is always a conversation going. We can get more done during splits and it's always a hoot with 2 other missionaries. Bad - It always seems to take longer to get things done such as weekly planning, showers, meals, shopping. Is the weather changing at all yet? Evenings cooling off? Yes, the Iowa clouds are back which means it's going to be overcast the the next 3 weeks and I'm going to lose my bronze tan. Right now it feels like a Phoenix winter, but soon the snow will come back and I'll be sad. Describe why your mother is better than any other mother on earth. Because she sends me awesome care packages and writes me all the time. She cares about my health and well being. She prays for me and my investigators. She keeps me up to date on all the news and fads. She is the glue of our family. She works hard to keep a home feeling like a home and makes me feel like I'm still at home. She has a testimony in Jesus Christ that has never ceased to radiate from her countenance. She is my mother. Well, not much has happened since I talked to you last Wednesday. Elder Noel and I have had a chance to tract our faces off this week. It was transfer week this last week, and Elder Noel and I didn't have to go to transfer meeting so we had some full days of tracting. We did have some appointments lined up but they fell through, and our back up is tracting of course. We actually tracted a whole town. It was this small town named Mooreland, Iowa (look it up on a map, it's like 7-8 square blocks with a bunch of farm houses surrounding it.) It took an afternoon but we were quick to find out that the town of Mooreland does not like the Mormons , catholicism or bust! D, the investigator that has a baptism date, backed out of church yesterday. We called her about an hour before church to make sure that the member that we had lined up for her ride with called her. She said that she did but she had been up all night studying about the Book of Mormon and our church on the internet. She said that she no longer wanted to come to church. Our hearts just dropped, we think she may have read some anti, or something crazy on the internet. We are going to try and see her again and answer some more of her questions and concerns. We are not really sure what happened. Other than that, not much more to tell you in the way of the mission. I do have some letters half way done and I am going to finish them today and get them to you guys. This week has been a great one. The district has 5 investigators with a date for baptism. The Hampton Sisters have a total of 4. Here in Fort Dodge we have 1 investigator with a date. Her name is D. She is an awesome 60 year old lady who is a media referral. We had a church tour with her the other day with our ward mission leader, Bro. Fortune, and committed her to baptism. She is lined up to be baptized on the 20th of November! We are so excited for her and have a lesson planned tomorrow with her with a member. Yesterday we stopped by to drop off a Book of Mormon. We did not give one to her yet, but Elder Johnson felt prompted that we needed to go over there and give her one. When we showed up she said that she had been thinking about the Book of Mormon the night before and looked it up on the Internet to find out more. She said that our timing was right on and she dove right into the book and the chapter that we left for her to read. 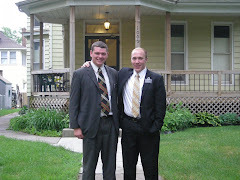 I also got to go on exchanges with Elder Gates this past week as well. He is the zone leader in our area. We had a very powerful lesson with a woman and her daughter that night. It truly was a lesson guided by the spirit. I don't think that Elder Gates understands how much I learned from that one lesson. It helped me to understand more fully how to teach with the spirit, and what I need to do better in my missionary efforts. We committed them to baptism, her daughter said yes, but her mother said she was not sure, so a commitment of prayer followed and we left on that spiritual high note. I'm going to try and get some letters out today, after hearing about all the crazy news down there. I'm bad at hand writing letters back to you guys, I always get side tracked by companions or scriptures. The good thing though is that I will be staying here in Fort Dodge for the time being. It's going to be an awesome Halloween and Thanksgiving in the heart of Iowa. Family, I have a favor to ask of you. The trunk-or-treat is coming up on the 29th of Oct. Could you possibly sent out some decorations for the trunk? We were thinking of wrapping ourselves in toilet paper and being mummys, but you guys might have a better idea than us. If you're still on the computer -- Hi! It took me a couple of hours of checking my e-mail on Monday before I remembered that it was transfer week and I wouldn't hear from you until Wednesday. I will definitely send you out a halloween package. Well, this week has been a tough one. I had training meeting this week in Des Moines again for 3 days. It was great training to go to, but oh boy it was hard to get through. We were bunked in a small apartment with some other elders, and I did not sleep well. The third day was the hardest for me, I woke up not feeling good, and Satan has just been hounding me all day long, I don't think I have ever had a day like that where he has just worked and worked on me as much as he did. I just seems like I haven't been myself the last week or so. I haven't felt good, Satan has been taking advantage of that. I have been literally drained of energy trying to keep my head on straight. It's just been a weird 7 days, hopefully everything will get back to normal. So please say a few extra prayers for me. Thank you for the letter with all that family history, it was awesome. I didn't know all that cool stuff about them and how they were in this same area fighting against the opposition, and here I am doing the same thing today. It just gave me goose bumps when I read both accounts from each side of the family. I really want to go back to Winter Quarters and look for their graves. Our teaching pool has finally begun to grow. It's taken some time but we have really been able to meet with some solid people this week. We met with this guy named A, who actually knows a member in the ward. He's started to read the Book of Mormon, but hasn't ever been able to find time to sit down with us and talk. Finally Saturday we had our first lesson with him. We talked about the restoration and committed him to baptism at the end of the lesson, but he felt like he wouldn't be ready in a month to be baptized, so we set up another date to come and talk with him and get him ready. Elder Johnson is leaving the tri-companionship. Our zone leader got called to be an AP, so Elder Johnson was called this morning to be a companion to the ZL in the Boone area for the rest of this week until transfers. So unfortunately I think I will need to invest in a GPS for this area. Elder Johnson had one and it really keeps us effective with this huge area so we won't get lost. I just wanted to let you know. As for me, everything is going swell. The only thing that I can say is that this area is way too big for one companionship. 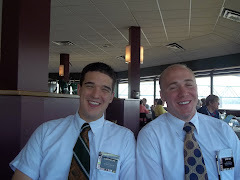 About 8 years ago there was 8 sets of Elders covering the same area that we are covering now. We are just spread out so thin, and we can only spent 1 day a week in an outside area, which barely begins to make a dent in all the finding and follow-ups that need to get done. And then there is the countless less-active. kind of to put it on a scale of how big this area is, we had district meeting Friday and had to drive 100 miles to get there. We have to spend a lot of time in traveling, and it drives me nuts! The people here are a lot slower at doing things, keeping commitments, appointments, answering phone calls, that kind of thing. So the work is a lot slower than Clinton which I am still trying to get used to. This week we also had Zone conference in Des Moines. It was a great meeting with President Jergensen going over how to better use members in the work, it was kind of a spin off of what Elder Zwick had taught us the week earlier. Our district also had interviews at the end of conference. President is such a teddy bear. Its just so easy to love the guy. As for the area, things have been going slow. Still we are doing a lot of finding with the recent baptisms that went on, and many potentials to follow up on. We were able to talk with a guy named M last night after General Conference. He was tracked into but we have never been able to get ahold of him since. We stopped by his house and he invited us right in. We found out that he is originally from Chile, but is now teaching Spanish at a high school. He went to our church in Chile for about 3 years when he was a kid. His neighbors invited him every Sunday to go with them. After about a 3 year span his neighbors moved away so he wasn't able to go anymore. He still could remember the primary songs that he learned and remembered how the church building looked and felt like. We talked to him about the Book of Mormon, he mentioned that he remembered a little about Joseph Smith, so we went on a talked about the Restoration and what happened to Joseph Smith. We left him with a Book of Mormon and left. The spirit was real apparent in his house as we talked with him, and we are so excited for him.